Join us for our FREE monthly story-time events held on the third Sunday of every month! 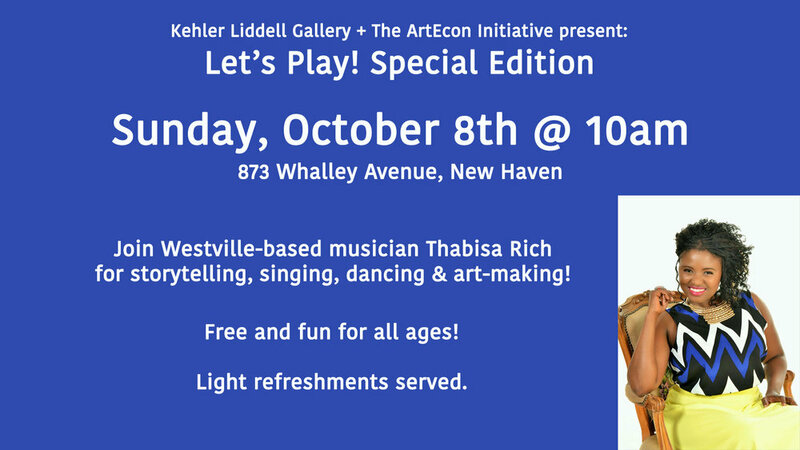 The event is led by member artist, Liz Antle-O'Donnell and Westville's very own, Muffy Pendergast. Each event features a story, songs and art activity inspired by the artwork on view. Materials and supplies free of charge. All ages are welcome! Light refreshments served. About Liz: Before becoming a mom to Oliver in 2015, Liz was an Early Childhood Educator for nearly a decade. A New Haven native, Liz taught at several area schools including: Calvin Hill Daycare and most recently, the Preschool at Neighborhood Music School. She and her family began hosting Let's Play as a fun way for families to gather and get to know each other. About Muffy: Deemed “The Empress of the Arts in Westville” (which she loves..), Muffy is a parent, art teacher, community arts organizer, and giant puppet facilitator. She likes to host art happenings at KLG, because she loves to create art with all the kids, while getting to know parents and grandparents, intending to further build community. This program is presented in partnership with The ArtEcon Initiative. Presented in conjunction with the exhibition, Vanishing, by Penrhyn and Rod Cook. Presented in conjunction with the group exhibition – Artist as Curator: Talk to Me. This month we will read: The Curious Garden, by Peter Brown, an uplifting tale of a young boy who plants a garden in the abandoned railways, turning the smoggy sky blue. We'll sing some of our old favorites about gardening and love, and continue working on a group earth-themed mobile project. We'll even do some planting for the Spring! This program, created in partnership with the ArtEcon Initiative, is made possible with support from the City of New Haven Mayor's Community Arts Grants Program.